Connecting networks of sustainable and eco-communities. In Sri Lanka a network called Sarvodaya brings together 2,000 villages actively pursuing more sustainable approaches to agriculture. Once, such a network might have been hard to reach in the Sri Lankan heartlands. Yet thanks to the web-based Global Ecovillage Network (GEN) – the villagers in Sarvodaya are now sharing their lessons with their equivalents in the Damanhur Federation in Italy, and with partners in Nimbin, Australia. 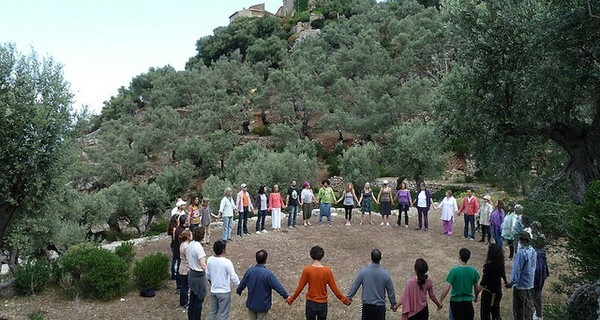 In Argentina, their peers are a group of ecovillages called the Gaia Asociación. All over the world, in small towns and villages, people are trying to create new ways to live, that are less environmentally destructive. GEN sprang up to connect these initiatives and provide a way for them to learn from one another, promoting the lessons they have learned, and coming together to campaign for change. Innovation often feels most risky when people believe they are on their own. By connecting environmental innovators from around the world, GEN is making the risks and exposure of innovation more manageable. This should in turn help small initiatives find wider support. Not all of the members are rural villages. The movement includes urban rejuvenation projects like the Los Angeles Eco-Village and Christiania in Copenhagen, permaculture design sites such as Crystal Waters in Australia, Cochabamba in Bolivia and Barus in Brazil, and also educational centres such as the Centre for Alternative Technology in Wales and Earthlands in Massachusetts. GEN is now officially recognised as a consultative partner by the UN and has become a significant voice in the global climate change movement.